Steven Soderbergh occupies a unique and rather contradictory position in the filmmaking world: on the one hand, he continues to turn out those glossy, big-budget, no-brainer Oceans films every three or four years, to quite staggering box office returns – Ocean’s Thirteen (2007), for example, grossed $300 million-plus from an $80 million budget. On the other hand, these big-hitters are interspersed with more low-key and obviously personal projects: the philosophically meditative Solaris (2002) or the noir-ish The Good German (2006), both of which were stylistically interesting, though proving to be box office poison. Given this pattern, an assessment of a new Soderbergh film means, to an extent, figuring out which category it falls into. A budget of $60 million may suggest that Che is no minor vanity project, but neither is a four-hour film largely in Spanish about a famously anti-American icon likely to appeal to the Oceans demographic. However, it seems safe to presume that Guevara’s iconic status both in Latin America and the wider world guarantees this film an audience independent of the director’s fan base. On its arrival in Cannes last year, the film was subject to both praise and criticism in almost equal measure, and it is not hard to see why; not only is its protagonist a figure of much historical controversy, but the film itself is far from conventional. In its original form, it was screened as a single 268 minute film simply entitled Che, a running time which was dramatically cut by 30 minutes by the time it made its arrival at the Toronto Film Festival some four months later. Now it hits cinema screens as two separate films, The Argentine and Guerilla, and, in the UK at least, released several weeks apart. Having only seen the first part, The Argentine, it is a little difficult completely to pass judgment on Che as a whole, but it is possible to make some key assessments of its structure, tone, and intentions. The life of Che Guevara reads something like a film plot – young, well-to-do doctor is transformed into a revolutionary leader, only to meet a messy and premature demise – and there have been several prior Ches on screen, most notoriously Omar Sharif (unbelievably!) in 1969’s Che!, and more recently in Walter Salles’ warm portrait of the young Ernesto in The Motorcycle Diaries (2004). His life has been portrayed in books, art, and music for the last fifty years, and his legacy the subject of fiercely partisan debate for just as long. The question facing anyone approaching this contentious subject matter is this: which Che do I examine? What many will expect from the films is a conventional biopic format, i.e. portray certain key moments of the protagonist’s life, show how these affected his worldview, and with a nice linear narrative (preferably romantic) beneath everything so no one gets lost or bored. What is surprising is just how little of that The Argentine gives us; instead we have a meticulously researched and crafted reconstruction of the minutiae of Che’s role in Fidel Castro’s assault on Cuba, intercut with scenes portraying his famous visit to the United Nations in New York in 1964, but with little or no information about his background: it can practically follow on from The Motorcycle Diaries with no overlap. Though we see much of the public Che – speechifying, organising his men, running, jumping, and shooting – there is precious little of the real Ernesto shown onscreen; close-ups are eschewed in favour of long and medium shots, the camera seemingly unwilling to invade his personal space for any length of time. What little we learn about the man is then confined to what we can glean from his public persona, which presents the audience with as oblique a portrait as Alberto Korda’s famous Guerrillero Heroico. In avoiding the usual biopic genre expectations, what emerges is something very different and unexpected. The public Che, with his pronouncements on politics and imperialism, becomes a personification of the revolution itself: falteringly human, contradictory in his very nature, but unerringly sure of the righteousness of his convictions. The film’s timeline begins in the confines of a pleasant dinner party, and we are invited to think about why this young man would leave this comfort to spend years in the jungle fighting for an ideology. What we do see along the way is the plight of the ordinary people, toiling both under a military dictatorship and gross social inequality, and can begin to understand better his motivations. In one comical but poignant scene, when attending to villagers’ ailments, one lady confesses to Dr. Guevara that nothing is wrong with her, she was there simply as she had never seen a doctor before. In terms of casting, it is hard to find fault. 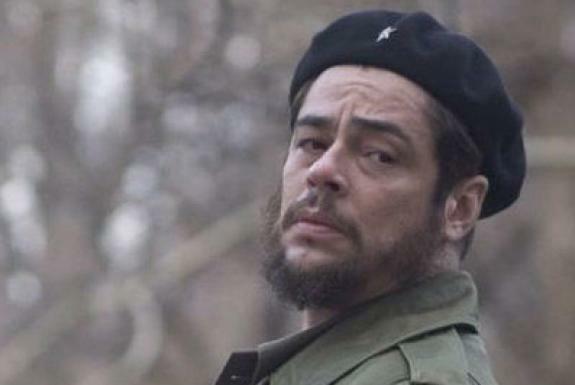 Benicio Del Toro’s stocky frame and seriousness of expression match that of the Che being portrayed, and his performance never seems overly mannered, even his continued labouring under his asthmatic wheezes. Squinting, I might not be able to tell apart Demián Bichir from the young Fidel Castro, who in his relatively minor role captures the dictator’s charismatic demeanour with suitable charm. Only Catalina Sandino Moreno seems misused, thanklessly having to be content mostly with jogging around with a rifle, though as the future Señora Guevara she is bound to figure more prominently in the film’s second part. On a more technical note, the film marks the most high profile use of the Red One digital camera, and the cinematographic results are no less than spectacular — this is certainly the future of filmmaking. Che Part One stands as a fascinating piece of biography making, not compromising towards linearity, generic expectation or narrative; for some this will be enough of a turn-off for it to be viewed as a failure, but a failure on whose terms? As I began, Soderbergh is a filmmaker of contradictions, aware of the financial realities of his craft, and able to make interesting projects happen thanks to his almost unique position within the industry. Perhaps that is why he was attracted to making a film about Che Guevara, who also had to defend the contradictions of his position – revolution may be about love of one’s fellow man, but this love necessitates killing. How can this paradox be reconciled? In private, this may be impossible, but in public one must attempt to square this circle.